If you’re anything like us here at the Conservancy, you’re probably ready to see the trees unfurl their green leaves for the summer. Once the leaves are out, it’s fairly easy to identify the oak, hickory, and maple trees around Cuyahoga Valley National Park, as well as the many other species in this area. For those of you who just can’t wait to get outside and explore, however, we have a special challenge: identifying trees just by their buds. The shape of the leaf scars. Leaf scars are the marks left by leaves after they fall off twigs and stems in autumn. Oak tree buds are sharply pointed and clustered at the end of the twig. 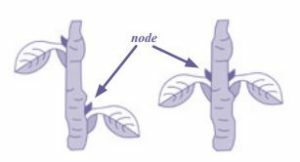 Each bud can be either smooth or slightly hairy at the very tip of the bud. Semi-circular leaf scars also appear slightly raised along the twig length. Many oak trees hang onto their leaves through the winter, so you might spot a few hardy leaves still on the branches. Keep an eye out for dropped acorns as well. Hickory tree buds grow on stout twigs. The terminal bud is relatively large and can be slightly scaly or covered in fine fuzz. The leaf scar directly beneath buds along the twig is typically heart-shaped. Look for hickory nuts and husks under the tree. 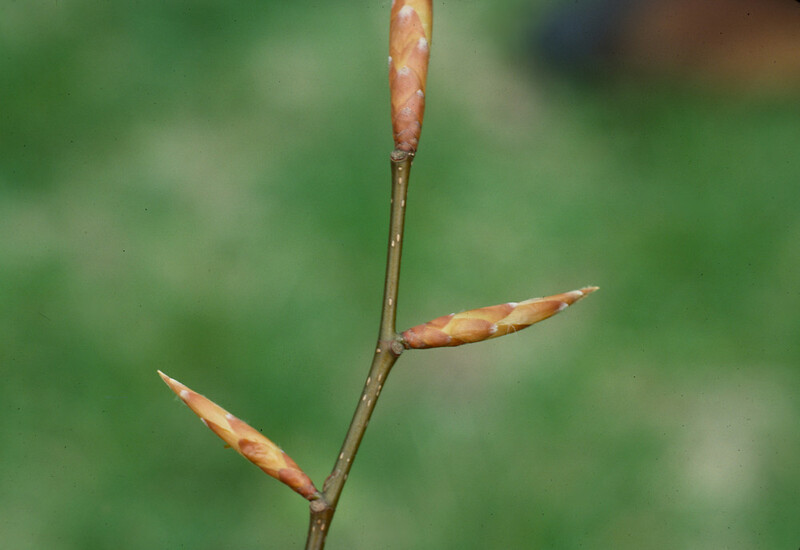 The terminal buds on maple trees are egg-shaped, not pointed like oak buds, and a bit larger than the other buds along the twig. There are also typically clusters of reddish buds along the length of the twig, called flower buds. The leaf scar along these twigs is shaped like a crescent. Beech trees have long, narrow, scaled buds. The bud’s thin shape is quite distinctive and hard to miss, and it’s typically a light brown. You might also spot some wispy white hairs on the buds. Beech trees also have smooth, gray bark that helps with identification before the leaves fill out. Sycamore tree twigs follow a zigzag shape—so they branch out angularly instead of following a straight line. The buds are large and cone-shaped, and the leaf scars nearly surround the buds. The bark of the sycamore tree is also quite distinctive—a shaggy, darker bark that peels off to reveal a lighter, younger bark beneath. The buckeye tree—our state tree!—has medium-sized buds on stout twigs (usually more than a quarter-inch thick). The overlapping scales on the buds are matte instead of shiny, and they flare very slightly at the edges if you look closely. Leaf scars are large and triangular. If you want to help make sure that native tree species like these and other native plants continue to thrive in Cuyahoga Valley, join us for a Habitat Restoration Drop-In. If you’re interested in learning about other meaningful ways to volunteer for CVNP visit, https://www.conservancyforcvnp.org/experience/volunteer/ongoing-opportunities/.